I’m sure I meant to blog in February. I started a post for two in my draft folder and I wrote PLENTY of posts in my head … but I never sat down and actually typed the words out like I intended to do. I did take a girls trip, spoke here and there and watched lots of swimming. It was Brittany’s last run at state and I was not missing a moment of it. Something BIG did happen in February though. Brittany decided (finally!) 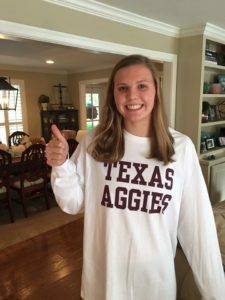 that she was going to attend Texas A&M in the fall. Everyone but Caroline (who refers to A&M as the “other college down the road”) is excited about it. And actually I think even Caroline is glad Brittany will be in Texas next year. The way she came to her decision had God’s fingerprints all over it. One of my favorite life verses is Psalm 73:28 that says “But as for me, it is good to be near God. I have made the Sovereign Lord my refuge. I will tell of all your deeds”. I put a date by that verse in my Bible to remember to “tell of His deeds” and so when the Lord does something SO OBVIOUS, I feel like I should share. From the time the college decision process began I have prayed for two specific things for Brittany …. wisdom for her decision and peace with what she decided. I never prayed about a specific school and told her often that I knew wherever she went she would thrive. She just had to decide. 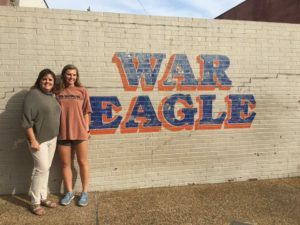 The day that applications opened she began applying and had her eye on two schools the entire time, Texas A&M and Auburn. We flew to Auburn one week for an official tour (AND WHAT A STORY IT WAS ….. from me telling Brittany Georgia was so dark because it had so many trees and then miles and miles later realizing Georgia was so dark because I didn’t have the car’s headlights on to BARELY, and I mean BARELY making our flight back to Houston because we (I) forgot to factor in the hour time change between Atlanta and Auburn). In spite of all the crazy, we really enjoyed our visit. We got back on a Wednesday and on Friday Brittany was going to College Station for the weekend. She had football tickets for the Ole Miss game and was looking forward to comparing the two schools. The Friday she was leaving to go she checked her portal and saw she was admitted to A&M. She was thrilled (and by thrilled I mean she was shaking like a leaf and her smile spread across her face so brightly). I’ll never forget her excitement. She had a great weekend and then began to ponder her decision. She made a list of pros and cons, talked to others and to us about what she was going to do and truly seemed to grow more confused as the days went on. She wanted to decide by Christmas but that didn’t happen. The days were dragging to weeks and months. We asked her if she needed to go for another look and even took a trip back to College Station. I knew she wanted to decide and continued to pray my same prayer, wisdom and peace. I began to wonder how and when she was ever going to make her decision. And I prayed some more. And God is SO very faithful. You see, Brittany left a day before we did to head to Austin for the swim meet. I called her and told her we had decided to stay for the weekend so we could go to church with Caroline on Sunday. She told me what clothes to bring her and we booked a room for two nights. The morning of the meet we came back up to our room after breakfast and I asked Bill if he thought we should pack up and move to a hotel closer to campus since we’d be spending time with Caroline. He agreed and we quickly packed up the room. I was shocked even at the time that Bill was ok taking the extra time to pack up as we were hurrying to the swim meet, but we did it. After the meet we went to a late lunch and then went to Caroline’s to hang out. Brittany took a nap, Bill worked and Caroline and I went to the grocery store to fill her empty shelves. About an hour later we were debating whether we’d be hungry enough for dinner or only dessert. We decided on dessert and as we were preparing to go Brittany said she was SO tired and asked if we could please go home. I was initially against it because I so wanted to go to Caroline’s church but after much discussion we decided it was best for us to head on home. But first dessert. It was SO good! We got home late but it was good to sleep in our own beds. After church the next day we went to lunch and talked about all kinds of things. After we had eaten Brittany casually (as is her style) mentioned that her class had not had a Sunday School lesson that day. She said instead they went around the group of girls and shared their favorite verse and what was going on in their lives. She told about her college decision struggle and said she just wasn’t sure about where to go and said a few reasons why she was struggling. Her teacher stopped her at this point and said something like this … “Brittany, there is something I need to say to you. I’m not being rude but you need to hear this. You are basing your decision on where to go to college based on other people and you need to go where you feel like you are supposed to go and not let other people influence your decision”. (I’m sure it was actually stated much better than I just paraphrased it there). 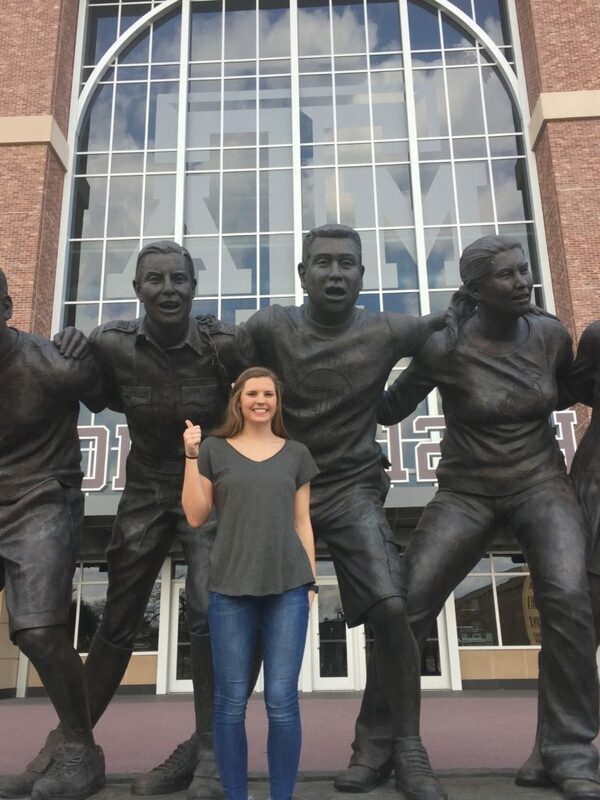 Brittany then stopped her story here and said … “And based on what my teacher said to me today I’ve decided that I am going to go to Texas A&M in the fall”. We could NOT believe it. Did we hear her correctly? I asked …. “did you just announce a college decision?”. She said “yes” and there were big smiles and maybe even a tear or two from her dad. And as we sat there celebrating her decision I realized God had answered my prayer. The WISDOM that her teacher imparted to her gave her the PEACE that she needed to make her final decision. On the way home from lunch I said to anyone who was listening … “I sure am glad we came home last night”. I think about how crazy it was that we did. We could have been in Austin and missed it. We could have stayed in the hotel a second night. Brittany’s Sunday School teacher could have prepared a lesson but instead felt led to ask the girls about what was going on in their lives. I fully believe God orchestrated all of it to give Brittany what she needed. Very cool story. I love when God reveals Himself, especially when it hits me later that He has done so. (Sometimes it takes a time to put those pieces together.) My prayers for Brittney are that A&M will be everything she wants, and needs, it to be. She will LOVE it there. Rachel is just so happy at A&M. Congrats and gig ’em! Well, you know I’m all about being an Aggie. And about being a Biola Eagle. Or a Longhorn. Mostly I’m about watching our kids learn to seek and listen to God on their own and watching His plan for them unfold as they grow in wisdom and stature. God is good! And here’s to amazing kids!